If I told you how I’ve spent this past month and what I’ve heard, you would tell me I am a liar. . . . But you walked onto the sky bridge [toward the center of the protest in the Admiralty District]. Your cell phone rang. It was Y: “The police started using tear gas.” He was watching a live broadcast in his office in Wan Chai. You put down the phone. Some minutes later, it was Y again. “The police went crazy. Do you really want to stay there? Come over for now.” Just then, you got your mom’s message begging you to leave. You went to Y’s office and watched the live broadcast together. You found out that not far from the office, there was a prayer meeting at 8 o’clock that evening. Both of you, who were never believers, went, and ran into S and W. When the pastor led the prayer, you quietly passed a tissue to Y. You had never thought that these three men [Y, S, W] could become so emotional. used tear gas earlier in evening to break up protest, September 28, 2014. HRIC photo. You sighed, that Occupy Central, a group of people sitting there, prepared to be arrested, would end in such a dramatic way. You promised that you would not return to the place of tear gas. If I told you that for one whole month, you would be on the street every single day, would you believe it? Would you believe that the Hong Kong girl who couldn’t stand being dirty could sit on the street every night? You once said that Hong Kongers were practical, that Occupy Central would fall apart as soon as a few mosquitos started biting the protesters, and that they’d begin to slip away after heading to the bathroom. You were wrong. You were thoroughly wrong. 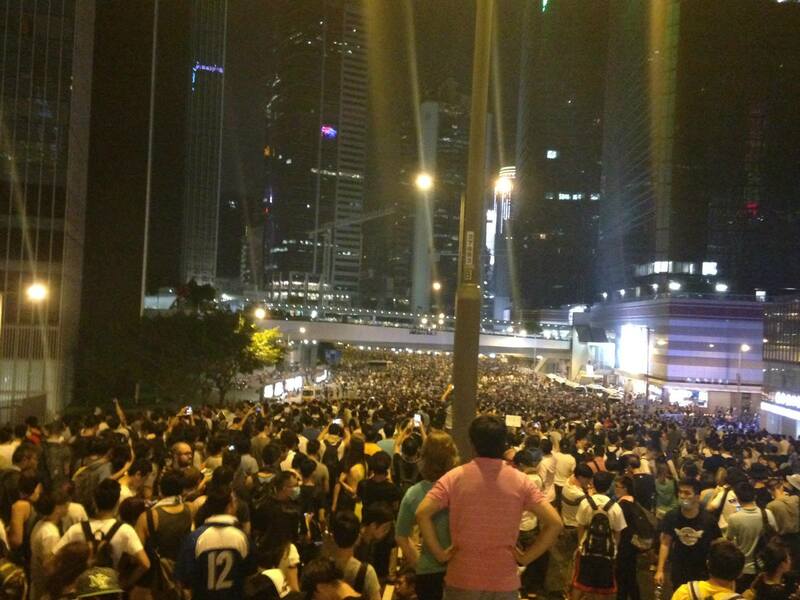 Let me tell you, in the next three days, you would see Hong Kongers pack the streets from Wan Chai to Central. After a while, when the crowd had dispersed somewhat, you would notice that Admiralty had turned into both a camping zone and an outdoor art gallery. Your biggest fear is hopping over concrete barriers when crossing the street, and thus you always have to look for pedestrian sky bridges. Knowing that Hong Kong girls like you are clumsy, some people built handrails and stairs on the concrete barriers so that you can cross freely, even if you wear a long skirt every day. You will see self-study halls emerge in the middle of the street. You will see people cultivating farms in Admiralty, and planting flowers in the concrete roads. You will watch all of this, but also experience it personally. You will meet a group of new friends to work on a media art installation titled “Stand By You: ‘Add Oil’ Machine’ for OCLP.” Every day in Admiralty, messages from all over the world that show support for the Occupy Movement are projected outside the government headquarters. Almost 40,000 messages will be collected this month, with many from countries like Vietnam and Ukraine—places you thought had nothing to do with us. You will finally get to appreciate what international solidarity means, and that the pursuit of democracy and freedom should never be done alone. All of a sudden, you will realize that you are actually doing something, even if the actual work is being done by a group of excellent young artists without taking credit. You don’t know anything, so all you do is be silly and tell jokes. So for the next month, every day after work, with no exception, you will be excited to meet up with the Add Oil Machine team. Friends from protest sites will know where to find you to have a chat since you are always here in this corner, every night. You are probably in disbelief of all this, right? You think Hong Kongers are economic animals who would only support democracy and freedom in their thoughts, but are unwilling to pay any actual price. Don’t worry. When you witness the utopia in Admiralty, which involves no monetary transaction, only mutual support, your jaw would drop—in a happy way. You love to reflect on what’s going on in this city. Ever since you began gradually learning about the concept of Occupy Central a year ago, you’ve been trying to write something to broaden the concept of the Occupy Movement as a spatial experiment, so as to let people know that Occupy Central is more than just sitting-in and waiting for arrest. Always profoundly pained by the backwardness in the use of Hong Kong’s public space, you want to put forth some progressive viewpoints. Let me tell you, after this month, you will become very humble. You thought that just because you’ve read about some theories and progressive experiences, you were capable of enlightening everyone. But when the Occupy Movement really happens, the Hong Kong people won’t need to read some magnum opus by you—they do it with their own hands. Book nerds like you are useless. 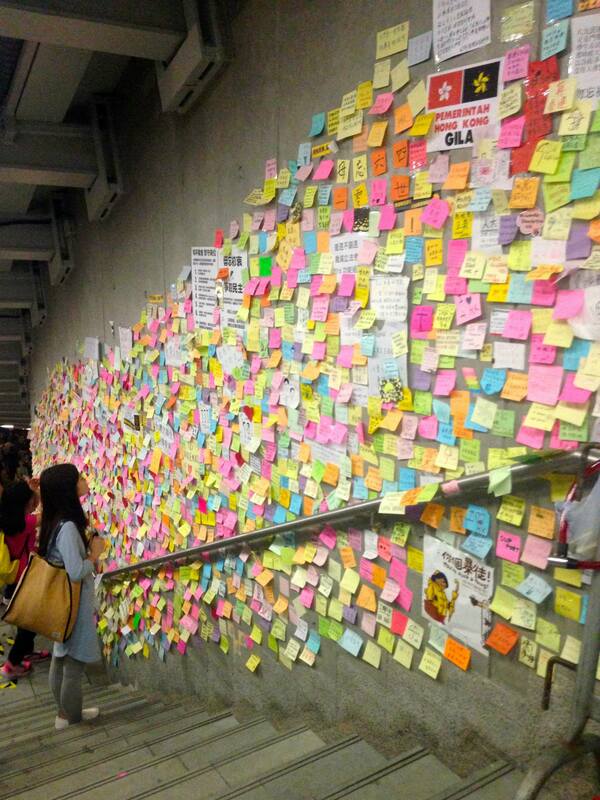 Lennon Wall, Admiralty, October 10, 2014. HRIC photo. I need to say goodbye to you, because after this month, I’ve become a completely different person than you are. I’ve come to finally believe in the power of the Hong Kong people; that we have smashed our long-standing self-stereotype as being practical, utilitarian, and selfish; that we are capable of self-governance; and that we have woken up. I’m no longer pessimistic and despairing about Hong Kong’s future like you are, because hope never resides in a good government, but in the awakened people and their realization that long-term vigilance about political power is the price to pay for freedom. At the risk of seeming ridiculous, let me say that the true revolutionary is guided by a great feeling of love. It is impossible to think of a genuine revolutionary lacking this quality. . . . We must strive every day so that this love of living humanity will be transformed into actual deeds, into acts that serve as examples, as a moving force. We believe in love. We believe in peace, sharing, honesty, selflessness, and truth. We believe that all humans are created equal, and that each should live a dignified life. What the dictatorial regime is most scared of is all forms of tenderness mentioned above. We resist and disobey not because we are violent, but because we want to grow strong in order to protect all the beauty and tenderness. Both you and I study political science. You know that even though I am in the habit of analyzing things, I never make any political predictions because I believe in human agency, and that drastic turns of history have never been predictable by anyone. Therefore, whenever people ask me for a timeframe for retreat or how this will end, I always say “I don’t know.” Granted, there’s so much that I don’t want to part with—all the friends I hang out with every night in Admiralty, and this extraordinary place in Hong Kong that is unprecedented in history. Nevertheless, I keep reminding myself to treat every night as if it were the last, and to open my eyes and feel every moment with my heart. If tonight were the last night, then I would etch every single beautiful scene and face in my heart. I know that all the energy I’ve accumulated this month will be sufficient for me to walk a very, very long road. Trust me, you will be very fulfilled in the upcoming month. Born and raised in Hong Kong, Kitty Ho was member of the Stand By You: “Add Oil’ Machine for OCLP team during the protest. She studied sociology, and her commentaries about local and international politics, interviews, and travelogues have been published in Ming Pao, City Magazine (號外), Hong Kong Economic Journal, thehousenews.com, and other Hong Kong and Taiwan newspapers and magazines. Music is her passion.